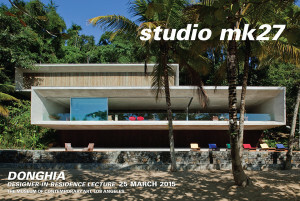 studio mk27 will be represented by founder Marcio Kogan and manager Mariana Simas. This lecture and cocktail reception are free and open to the public. Reservations are recommended as seating is limited to 150. Call 310.665.6867 or email mherrera@otis.edu to reserve a seat(s). Marcio Kogan leads a team of architects, who at large, have been working with him for over a decade. Since 2001, when he started a co-creation and cooperative work system at the office, studio mk27 has won over 200 national and international awards, such as: IAB (Institute of Brazilian Architects), Sao Paulo Architecture Biennale, WAF, Architectural Review, Dedalo Minosse, Record House, LEAF, D&AD, Spark, Barbara Cappochin, Iconic, AZ and Wallpaper Design Award. The team at studio mk27 has spoken at the Royal Academy of Arts, AIA, Societe Francaise Des Architectes, Clubovka, FAU-USP e Mack universities, FAAP, Polytechnic of Milan and Valencia, South Florida, Rice University, Texas, among others. In 2012 studio mk27 represented Brazil at the Venice Biennale which meant some extra kilos for the group of 10 architects who went for a gondola ride. Donghia Designers-in-Residence studio mk27 also will direct a one-week Master Class at OTIS College of Art and Design between March 20 and 25, 2015. The Donghia Designer-in-Residency program (Lecture and Master Class) are made possible through a generous grant from the ANGELO DONGHIA FOUNDATION, which provides support for the advancement of education in the field of interior design and for the investigation and treatment of AIDS and its related diseases. The Donghia Designer-in-Residency program was organized by the ARCHITECTURE/LANDSCAPE/INTERIORS Department at Otis College of Art and Design, which offers a synthetic curriculum of the spatial design fields. For information about the lecture or department call 310.665.6867, email ArchitectureLandscapeInteriors@otis.edu or visit www.otis.edu/ali.